I’ve been meaning to write this post for a long time now. I actually sat down and wrote out his whole birth story on another blog, hit submit, and to my horror, it didn’t save. I thought today would be a good day to sit down and reflect. Life has been SO busy the past few weeks, and truly, I have a million things that are screaming for my attention right now to get completed, but sometimes you have to take a moment for yourself… and that’s what I’m doing! My original due date was October 6th. Asher was born two days early on October 4th. Now, there’s some speculation that it has everything to do with Vidalia High School’s homecoming because Elijah was born on Homecoming 2012 and, yep, you guessed it! Asher was born on Homecoming 2013. Anyways, that’s beside the point. 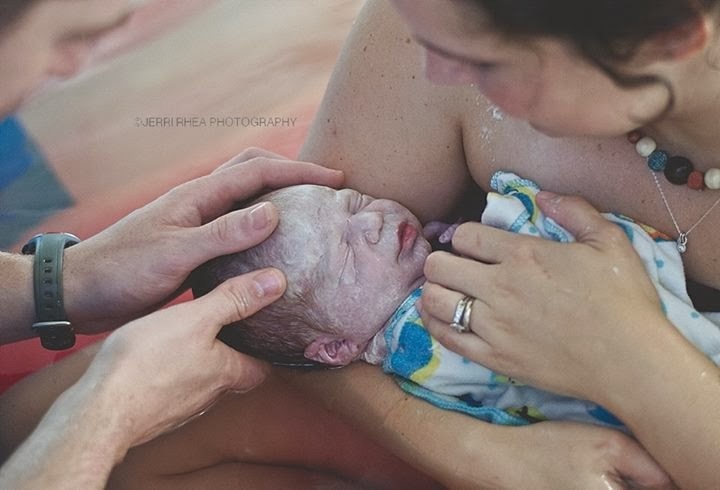 The birth story. Here we go! I began to have “signs of labor” early in the week. I spoke with my midwife and she confirmed that these were signs that labor would probably begin within the next few days. I woke up around 1:00 Friday morning for one of my [many] nightly bathroom trips and then hopped back in to bed. Around 2:30, Lance woke me up as he climbed back in to bed from one of his bathroom trips. As I lay there in a state of semi-consciousness, I thought, “This kind of feels like I’m having a contraction.” It was then that I fully woke up, but the contraction-like feeling was gone. I checked the clock and decided to go to the bathroom again since I was already wide awake and I knew, if I didn’t go then, I’d be awake in another hour or so having to go. I rolled out of bed and that’s when I realized my water had began leaking. 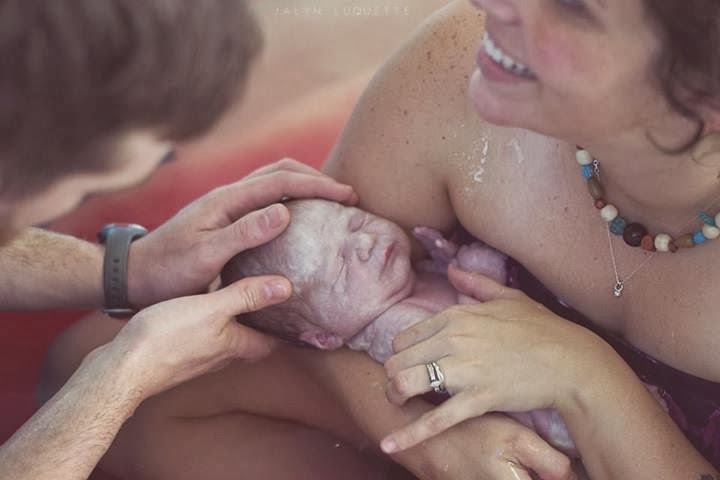 It took me a few minutes to really accept what was happening because this was already so different than my previous birth, but I accepted it when the next little gush of water came and confirmed that this was really happening! I went in to the living room and called my midwife to let her know I was going in to labor. I wasn’t having any contractions though so we both decided to go back to sleep until my contractions were regular. Around 4:15, I gave her a call to let her know I was having contractions about every 10 minutes now. She said she would call the rest of the birth team and be on her way. Fast forward to 5:30. I heard Lance’s alarm going off for work so I went back to the bedroom to see if he was up. He had just rolled over when he saw me walk in the room and he asked, “What are you doing up?” Casually, I said, “Getting ready to have a baby–I’m in labor.” He didn’t believe me when I told him I was in labor with Elijah, so I don’t know why I thought he’d believe me now! He asked a few more times if I was being serious before he was really convinced I was in labor! He made the call in to his boss that he wouldn’t be coming in to work. So, now would be a good time to combine a lot of hours of labor in to a short paragraph. My contractions basically stopped after I called my midwife at 4:15. I would have 1 every 30-45 minutes, and it was usually pretty intense when I did have it. I went for a 2.5 mile walk with Lance &amp; Elijah trying to get labor to start (I even talked to my sister-in-law while doing this and she never suspected a thing! Sorry Lauren! =/ ) I had some good contractions in there, but still no regular labor. Back at the house (8:45ish) I decided to go to the bedroom to sit on the ball and try to nap between contractions while Lance watched Elijah in the living room. Around 9:45, I had a contraction I had to get up and walk through; I thought I was going to throw up because of the pain. I’d say that by 10:00 my contractions were now starting to come regularly and they were very intense. It took a few contractions for me to figure out the best way to cope. I would go from sweating during a contraction to freezing when it was over so I chose to stand in the doorway of our bathroom right in front of the air conditioner. I turned on some Kim Walker-Smith worship music. During a contraction, I would turn on the air conditioner, hold my belly, and completely tune-in to what was going on with my body. Once the contraction was over, I’d turn the air conditioner off and gaze outside of our bedroom window while getting lost in the worship music. Contractions began coming a lot closer together and I could feel the pressure of Asher moving down. It was so hard not to fight my body during contractions now-everything in me wanted to tense up and try to “run” from the pain, but my mind won the battle and I would force myself to relax and let my body do what it needed to do. Every contraction was a “run or relax” battle. 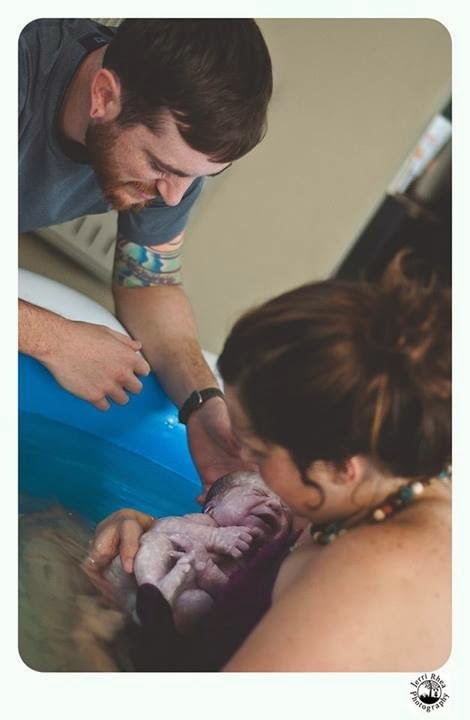 [Now, with Elijah, I got in to the birthing pool earlier than I would have liked (in retrospect) so I had set my mind to stay out of the water as long as possible during this labor as not to slow it down any.] I remember at one point really hurting in my low back, so much that once a contraction ended, I climbed on to our bed on my hands and knees and did some yoga poses to stretch, trying to ease the discomfort in my back. I got up and maybe had one more contraction before I announced that I was ready to get in the pool. I think it was a little after 11:00 when I got in to the birthing pool. We had a little scare with Asher’s heartbeat being very low when I got to the living room, so Alina rechecked his heartbeat once I was in the water and it was back to normal again. She asked to check me and then announced, “You’re about to have this baby!! You’re fully dialated and his head is right there!” [She later explained that the final decent in to the birth canal can sometimes cause the baby’s heartbeat to drop, and then it goes back to normal and when she checked me, that confirmed her suspicion that this is what had happened.] I was totally relieved to hear that the only thing left to do was actually birth Asher! I accomplished my goal of not getting in the water too soon this time, and was very proud! Once in the water, I’d have a contraction [it was most comfortable to handle these sitting on my knees, leaned against the side of the pool] and after the contraction would end, I’d sit back and lay on the side of the pool. I’d chat with whoever was right there until another contraction came, and then I’d get back on my knees. I had been resisting the urge to push for a few contractions and finally I just couldn’t resist anymore. I decided to “test push” with a contraction to see what would happen. Someone said, “Was she just pushing? !” and then there was a LOT of movement everywhere around the room. Alina (my midwife) rolled up her pants, preparing to have to hop in the pool to help catch Asher! I pushed with my next contraction, but could tell it wasn’t time. So I waited until the next contraction. Pushed some more. Nope, he still wasn’t quite ready. Waited for the next contraction, and decided it was time. I pushed. And I pushed. It seemed like forever! And finally! Lance was sitting outside of the pool right by me so I gave him a play-by-play of everything that was happening. “There’s his head… annnnnnd, here he is!” I picked Asher up and showed him to Lance! It was perfect! He was perfect! I quickly realized that his cord was a little short, so I had to sit indian style so that I could hold him to me and keep him in the water. His cord was still pulsing, and I didn’t want to clamp it until it stopped pulsing. 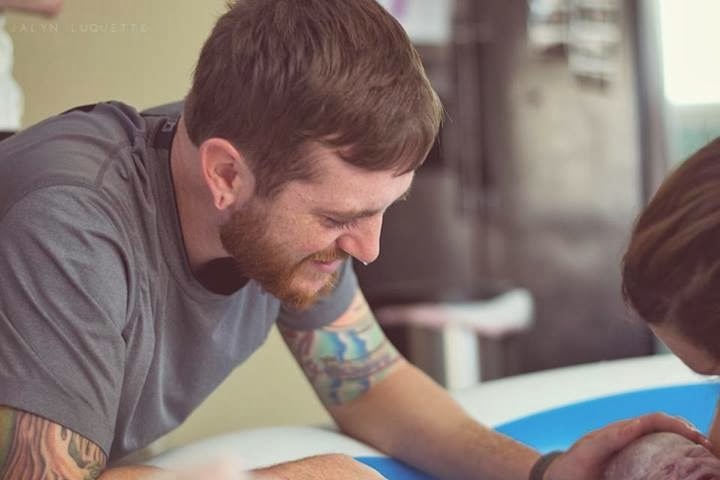 I ended up delivering the placenta pretty quickly, and this made it so much easier to get comfortable with him. I “floated” over to an inflatable seat in the corner of the pool to rest and relax with my baby! Asher Peyton was born at 12:12 on Friday, October 4th 2013 weighing 7 pounds, 12 ounces and measuring 20 1/4 inches long. This labor and birth was a LOT easier than my first labor and birth (which was also a homebirth). I contribute a lot of the quicker labor to red raspberry leaf tea, and an easier birth to experience. The healing was a lot easier this time, too! Here’s some things that not many people know. I got pregnant with Asher only 3 months after having my first baby. It wasn’t planned [not by Lance and I at least!]. We didn’t announce the pregnancy right after finding out because we had some scares. I spotted some at 5 weeks and again at 9 weeks. It’s not too unheard of to spot the first time you would have a cycle right after getting pregnant, but it’s pretty rare to do it twice. I thought I was miscarrying. I visited a friend at 12 weeks to use her doppler to listen to the baby’s heartbeat. (Before 12 weeks, the baby is too small for the heartbeat to pick up on a doppler, but once you hit 12 weeks, it’s fairly easy to find it.) We tried for 10 or 15 minutes to find the heartbeat and never did find one. I left her house with a peace about everything, but I was more convinced now that something was wrong. Because of insurance issues, I didn’t get to the doctor until week 14. The ultrasound technician had no clue that we suspected something was wrong so he was just being light hearted and taking his time with everything. I remember looking at the baby on the screen and not seeing any movement at all… and my heart sank. I blurted out, “He’s not moving…” and that’s when the tech said, “Oh, it’s because I have it paused, see?” Apparently he unpaused it at that point because the little baby on the screen began moving and jerking. It was such a relief at that moment. We began telling people after the appointment that we were expecting another baby. Alright, I’m finished! Here’s some pictures! When I realized I was in labor, I decided to get once last shot of my belly! Apparently something I said was funny!